Neutrik Patch Panely | PRO MUSIC, s.r.o. 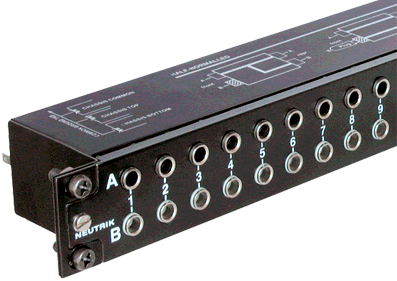 The NPPA panels are an innovative and compact patching system (just 1U high) for 19" rack mounting. Robustly housed in a black coated steel shell and featuring precision aluminium fittings it is built to last. All NPPA panels are fitted with high quality, long life NJ3TTA gold plated double contact jacks (2×48), featuring drastically improved contact integrity. The NYS-SPP-L1 is a economical and remarkable sleek designed 1/4“ modular Patch Panel for 19“ rack mount (19“ x 1U) with a reinforced metal housing. Each of it‘s 48 PCB wired balanced channels (24 front pairs and corresponding 24 rear pairs) can either be grounded separately or in groups of individually chooseable channel numbers. The PCBs are held securely in place by being clamped between the front and the rear panel, this grants an easy reconfiguration of the Patch Panel without the danger of loosing any small parts (e.g. nuts). The grey jack serves as an easy and distinguishable normalling identification.